The Bundeswehr parade belt looks like a relic from the times when the German bootheels last clacked around Europe. Complete with a metal buckle with the national eagle and the motto of the Democratic Germany: "Links Zwei Drei Vier!" or something. These are getting harder and harder to acquire! If you want one, we suggest taking aktion pretty quickly, ja! 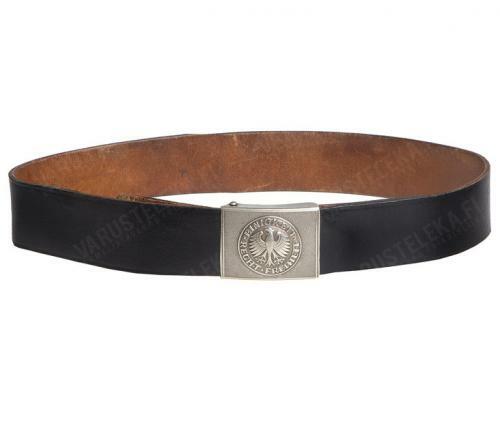 Apparently still used during the suspicious Zapfenstreich marches, the Bundeswehr parade belt is a proper thick & wide (5 cm / 2") indestructible item. We gotta love the German design - many other countries' combat belts aren't this sturdy! Two different buckle adjustment types: two prongs inside the buckle into a suitable pair of holes in the tongue. Some belts have a simpler sliding adjustment, which is stepless and can be adjusted down as much as you like. We do not differentiate. Sizes are the maximum lengths of the belts. These can be adjusted about 12 cm downwards (the two-prong-buckle types). Because Men of Girth have more money, larger sizes cost more. However it's still a good deal for a belt of such impeccable quality. In used, but good serviceable condition. This will probably outlast the user. This lot was dug out from the deepest levels of our supplier's warehouse. It's very possible these won't be seen again once this batch is gone. - jos tuo soljen kiiltävyys häiritsee, voi sitä värjätä varovasti "liekittämällä"
Vyö lukittuu solkeen samalla tavalla kuin sotaa edeltäneet Suomen/Saksan/Tsekkoslovakian vyöt, mutta on 5 mm leveämpi. Jos suunnittelet tästä vyötä johonkin muuhun solkeen tulet pettymään. The belt looks similar to the pre-ww2 military belts (Czech/Finnish/German) but is 5 mm wider, so you can't use other buckles. Just so you know. Other than that, it's a good belt. ; mind you : a 1/4 mm difference would not pass DE MilSpec but these belts (all of those 100 cm i ordered online were almost all 70cm ... my waist was 90 cm so training was the only way to get the belt to fit. 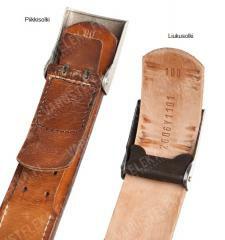 Again blame time and people who customized their belts, not Varust. In the original belt design of this BW Parade belt is a+5 cm / -5cm adjustement. Super quality here! Mine came almost new. Glad I acted fast on getting it! Aivan super kunnon hyvä vyö. Saamani kappale oli kuin pakasta repäisty, liekö koskaan ollut käytössä. Kestää varmasti kauemmin kuin käyttäjä. Miinuksena ei käy mihin tahansa housuihin, esim. särmä retkeilyhousuissa ja raw denim farkuissa nipinnapin liian kapea vyölenkki (seuraavaan erään 5mm leveämpi vyölenkki jooko?). Five hundred stars for this belt. received one with the two prong buckle UNISSUED. Brand new and never used. 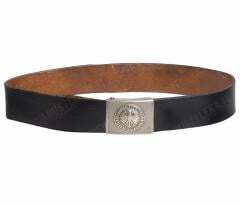 A 5cm large, thick piece of leather with an indestructible buckle. Tottahan minä tunaroin ja tilasin aivan liian suuren vyön, koska tilaamani oli tuommoinen vanhan mallinen. Piti käydä suutarilla sitä lyhennyttämässä, eli käytännössä siirrättämässä tuota reikäsysteemiä taaksepäin. 20 minuutin homma. Omani soljessa oli jotain vihreää väriä, (tussin?) mikä kylläkin lähti juuresharjalla ja lämpimällä vedellä pois. Täydet pisteet laadulle ja ulkonäölle, ja eikun polttamaan Rovaniem... siis eräilemään! Item was in issued condition, with some use marks. Got the "prongs and holes" edition. It is really wide (5cm), does not fit the BW flecktarn pants. Buckle looks very nice though, after I'll get it cleaned up a bit.